I saw this rarity first back in 2001 during a period when I was discovering the 40s Fox musicals which had somehow eluded me for forty years. They were a great balm during stressful times with their utter mindlessness in glamorous settings among dazzling sets in lurid Technicolor. Outside of MGM, the best stable of musical talent was at 20th Century Fox. And once they join forces with Rodgers & Hammerstein they’ll overtake even MGM. But in 1950 Fox was still making light entertainments with the likes of Don Ameche Alice Faye and Betty Grable—who even at this point in time was the #3 box office star in America, behind John Wayne and Martin & Lewis (who apparently count as one). I doubt that I should ever have seen this film were it not for Turner Classic Movies, which happily is the sometime refuge of real movie clunkers in the vault (the disc I watched was taped off the channel.) Apparently this is one forgotten obscurity Fox didn’t see fit to ever release in commercial form. As an example of my premise that Hlwd was bowing more to Bway showmanship, Call Me Mister doesn’t pass muster. Like countless acquisitions from Bway before it, the film becomes something almost unrecognizable from its source, which makes you wonder why they even bothered. With a war raging in Korea, the story and location were changed to the American occupation of post-war Japan, allowing for some untypical scenery as well as some in-the-moment social attitudes and racial stereotypes that don’t look so pretty sixty years later. Whether by accident or design, curiously the whole film is in blue, grey and khaki, with barely a hint of any other colors thru-out. 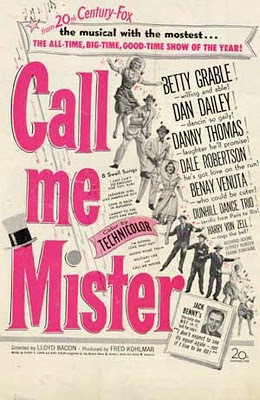 On Broadway Call Me Mister was a popular post-war revue which captured scenes and sentiments of troops returning to civilian life. It ran for two years, concurrently with Annie Get Your Gun. Fox lost Annie (couldn’t you see Grable as Oakley?) but nabbed CMMr. and did what was all too common a practice by then; threw out just about everything in it--including its two stars: Betty Garrett & Jules Munshin who rode this success to a contract with MGM, and were both just off the biggest hit they would ever have in Hlwd (On the Town). So Fox got Betty Grable & Dan Dailey, and threw Danny Thomas and Benay Venuta in for good (or not) measure. 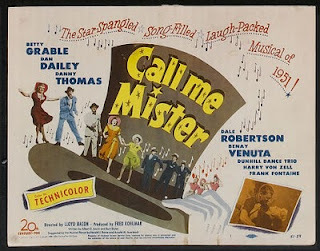 Unfortunately Call Me Mister suffers from a dull script about a separated show-biz couple meeting up in post-war Japan, where Dan Dailey (with the spiffy name of Shep Dooley) goes continually AWOL for Grable. Too many dull dialogue scenes don’t help any, nor the army humor given to Danny Thomas as the ethnic (for 1950) soldier. His scenes are so painful to watch you can see his film career failing before your eyes. Benay Venuta hasn’t anything here to distinguish herself, much as in Annie Get Your Gun, and her screen work is also done. Dan Dailey reminds me of a high school basketball coach with a touch of hoofer in him. He’s handsome in a rugged, ordinary way and sings & dances pleasantly enough without giving Kelly or Sinatra a run for their money. In fact he’s a perfect compliment to Grable--pleasant, hard-working, good but not great. But then here they’re stuck with that script. Gee, I wish I had a G.I. After this pacific overture, thru a flurry of fans, the song morphs into a tap dance with Grable, now in sailor suit with a trio of G.I.s doing a nautical Riverdance while looking like a pack of sardines. Still it’s a nice, tight routine (these guys are back later for their own acrobatic turn, much like a Nicholas Bros. number) and Grable proves a game gal. All the numbers are scaled to realistic stage dimensions (even the “Going Home Train” which transcends its immobile set with fancy camerawork), until the finale, where it seems the idea was to go full-out Hlwd soundstage for a piece of updated Depression-era frivolity called “Love is Back in Business” with lines like “the moon is ringing up sales again,” and some bizarre and completely unrelated scenic elements including a giant hydraulic lift that rises within a painted canyon of skyscrapers. The cast, after drowning in khaki suddenly pop in hints of civilian color, while a wind machine keeps the skirts furiously blowing. It feels so very 1951. Bway Fidelity: D a title, sketch & 3 songs.